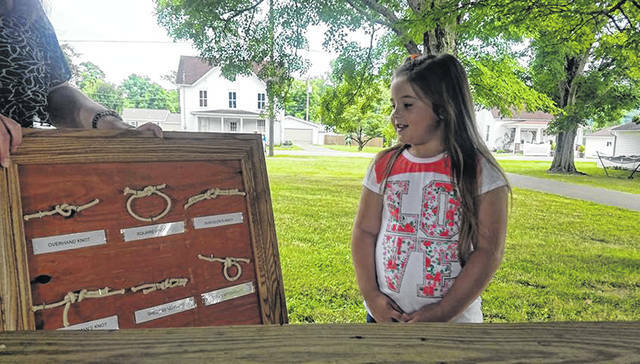 Layla Nibert, Daisy Girl Scout Troop 1006, demonstrates her knot board that she made with her Grandpa. Brownie Troop 10046 talks to the judge about their service project for the dog pound. 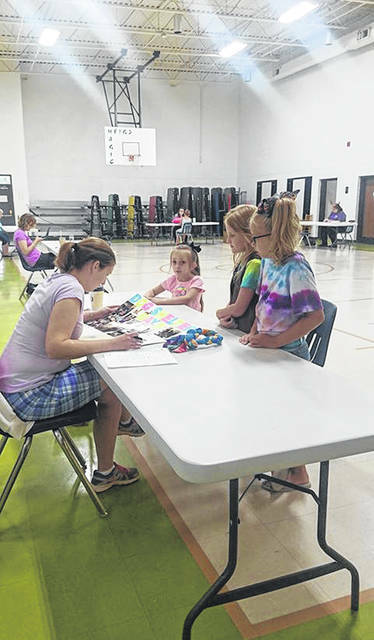 MEIGS COUNTY — Girl Scouts around the county have been busy preparing for the 2018 Meigs County Fair, recently completing judging for their projects. The 2018 Champion Awards went to Daisy, Lillian Roush, Troop 10046; Brownie, Haylee Stout, Troop 1006; Junior, Taylor Engle, Troop 1004; and Cadette, Faith Roush, Troop 1350. These girls each earned one or more Grand Champion award in the categories. Lillian Roush, Troop 10046 — Life Skills, No Sew situpon, Grand Champion; Culinary, Cupcakes, Grand Champion; Science and Beyond, Carpentry, Blue Ribbon. Kailey Aldridge, Troop 1006 — Life Skills, No Sew blanket, Blue; Arts, Misc., Grand Champion. Courtlynn Krauetter, Troop 1006 — Arts, Blow Art, Reserve. Caylor Lyons, Troop 1006 — Science and Beyond, Gemologist, Blue Ribbon. Haylee Stout, Troop 1006 — Life Skills, Grand Champion; Culinary, Apple Pie, Grand Champion; Communication, Scrapbook, Reserve; Girl Scout Program, Blue Ribbon; Arts, Grand Champion; Science and Beyond, Recyling, Grand Champion; Outdoors, Grand Champion; Customs and Traditions, Reserve. Gracie Banks, Troop 10046 — Life Skills, cook book, Blue; Culinary, candy, Reserve; Arts, Reserve. Gracie Barton, Troop 1006 — Life Skills, no sew blanket, White; Arts, Slime, Reserve. Mariah Langdon, Troop 10046 — Life Skills, no sew, White. Troop 1004, Jennifer McKibben, Leader — Girl Scout Program, Celebrations,Thinking Day, Blue Ribbon; Girl Scout Program, Journeys, Grand Champion; Arts, Tiki necklaces, Grand Champion. Troop 1006, Jerrena Dill, Leader — Celebrations, Thinking Day, Reserve; Camping, Camp Kiashuta, Blue Ribbon; Outdoors, situpon, Blue Ribbon; Customs and Traditions, Service Projects, Reserve. Troop 10046, Shannon Banks, Leader — Customs and Traditions, Service Projects, Grand Champion. Sidney Workman, Troop 1350 — Culinary, cupcakes, white ribbon. Erin McKibben, Troop 1004 — Life Skills, Sports-Ballet Bar, Grand Champion; Life Skills, One pot meal, Grand Champion; Culinary, Magic Bars, Blue Ribbon; Communication, Misc photography, Grand Champion; Arts, 3D Art, Grand Champion; Science and Beyond, Recycling, Grand Champion; Science and Beyond, Carpentry, Reserve; Customs and Traditions, Heritage Craft, Reserve. Samantha Eblin, Troop 1004 — Arts, Painting, Grand Champion; Arts, Drawing, Reserve. Graycie Lamb, Troop 1004 — Arts, Fiber Art, Grand Champion; Science and Beyond, Recycling, Grand Champion. Claire Howard, Troop 1350 — Arts, Fiber, Reserve; Arts, Decorated Clothing, Grand Champion; Science and Beyond, Recycling, Reserve; Culinary, Burger cookies, Grand Champion. Taylor Engle, Troop 1004 — Arts, Performing, Grand Champion. Brailynn Lamb, Troop 1004 — Arts, Flower, Reserve; Science and Beyond, Reserve. The Girl Scouts will be taking part in several events during the fair, including the Junior Fair Pet Show and Meigs County’s Got Talent. The Pet Show will take place on the Friday of fair week at 9 a.m. in the small arena. Categories include best cat, best dog, best rodent, most talented (age 3-12 and age 13 and up), best dressed, most unusual. Meigs County’s Got Talent will take place from 3-5 p.m. on the Hill Stage on Friday at the fair. There will be categories for song, dance and miscellaneous. https://www.mydailysentinel.com/wp-content/uploads/sites/14/2018/08/web1_8.8-Girl-Scouts-1_ne20188792017691.jpgLayla Nibert, Daisy Girl Scout Troop 1006, demonstrates her knot board that she made with her Grandpa. https://www.mydailysentinel.com/wp-content/uploads/sites/14/2018/08/web1_8.8-Girl-Scouts-2_ne20188792020815.jpgBrownie Troop 10046 talks to the judge about their service project for the dog pound.